Classes are held on Monday, Tuesday, Wednesday, Thursday and Friday. Classes begin at 3pm and end at 8pm daily. Registration must be completed before the first day of class. Student must score 90 credits in order to graduate. Students will receive a progress report at the end of each ten week quarter. Any students that require a copy of their transcripts must contact the school administrator. During each quarter, each student will be allowed five absences from this number, if the student exceeds this number, the number of days will count against the students final grade. 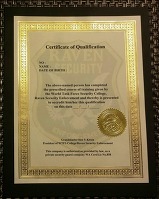 The World Task Force Security College does not offer any form of financial aid. WTFSC reserves the right to refuse any candidate for cadet status for any reason above and beyond the U.S. state department and PVS Act of WA. It is not an accreditation college that grants degrees, but students related industries and receives award certifications, diploma. 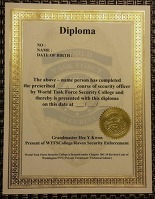 WTFSCollege is create a list of all graduates who have graduated from the college and report to the WTECB Washington.